One misconception some people have about RVing is that you can’t possibly have wholesome, healthy, home-cooked meals prepared in such a small kitchen. The belief is that all of us eat out of cans (baked beans anyone?) 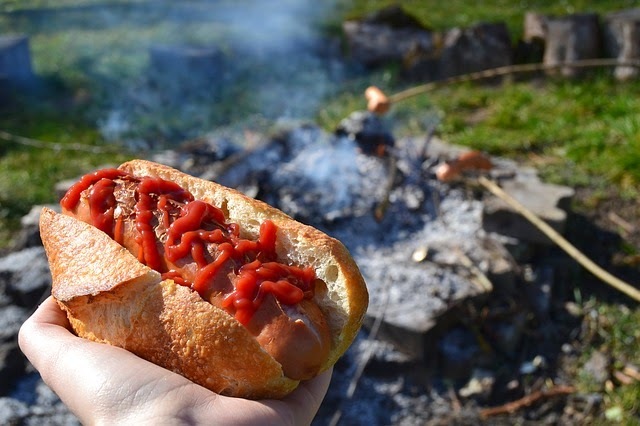 and survive on hot dogs, s’mores and pancakes made in a shaker bottle. Well, in the world of fulltimers you’ll definitely find those who eat the more traditional “camp fire meals” but you’ll also find some real gourmands making even those with a 200 square foot kitchen (let alone 200 square foot home) envious. I am neither a campfire cook (except on occasion for fun) nor a gourmand. I am, however, pretty good at following a recipe. I’m also a vegan and Clark is not. That means I do a lot of cooking (sometimes 6 different meals a day). If you think that sounds exhausting you’d be right! And remember, with limited counter space, a limited number of pots and pans and tiny sink, it also means doing a lot of dishes. Our kitchen…note the sink full of dishes (at least they’re clean). In the various RV forums found online there are always questions from RV-wannabees asking how to pare down their kitchen utensils and gadgets. It’s a hard question to answer because we all have different preferences and dietary needs. I don’t bake much so I only allot a small space for baking supplies but for someone who loves to bake it may be worth it to find a place to store their baking supplies even if it means sacrificing other things. 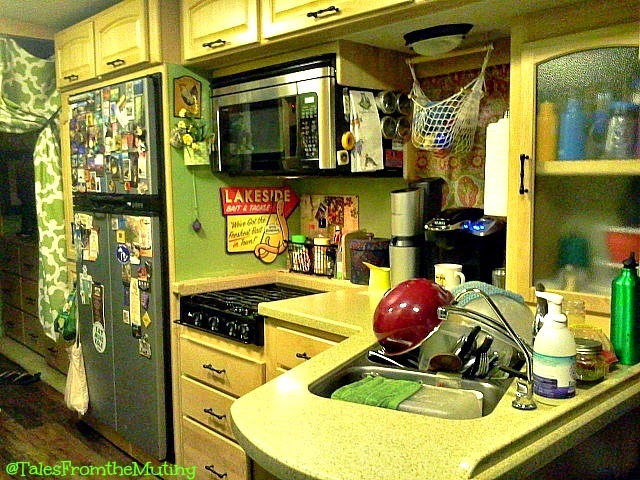 RV size and storage space will also dictate (to some extent) what you can get away with in your kitchen arsenal. One tip I can give you is to not be afraid to use your storage space in non-traditional ways. Perhaps you can store your clothes in overhead cabinets so that you can transform your closet into the pantry of your dreams…only you can determine what’s most important. So, what’s in the kitchen on board the Mutiny? *They no longer sell my exact model. It is, after all, over 20 years old. I’ve heard great things about reconditioned models but please do your own research. I bought mine new at Costco many moons ago. 2) Food Chopper. Mine is from Pampered Chef (hey, I was invited to a party and have a hard time saying no) and has been a great tool to speed up the prep process. It chops everything from tomatoes to nuts. It also cleans up easily. 3) Mandoline. While I don’t use it as frequently as the chopper it takes up very little space. And it’s pretty handy for those who eat a lot of veggies and/or like to make their own french fries. It helps add a little pizzazz to salads too. 4) Rice Cooker. One thing you learn about a tiny kitchen is that everything should hae more than one job…and a rice cooker fits the bill. Not only can you cook rice in it (duh) but did you know you can make beans, soup, potatoes, hard boiled eggs, one pot meals and even pancakes in a rice cooker?? I didn’t either until I read Roger Eberts blog post The Pot and How to Use It. Believe it or not, this is probably the link I share the most. *I have a very, very basic Rival 6 cup rice cooker that has served me well but if and when I am ready to replace it I’ll be getting the Aroma 8-cup model shown above. The Rival often cooks over, especially if I try to use more than one cup of rice. 5) Convection/Microwave Combo. I love our convection oven and find it pretty handy. While it’s not all that big (I can’t roast a turkey in it) it’s been plenty big enough for what we do eat…homemade bread, muffins, cupcakes, cornbread, brownies, etc. We also use the microwave (sparingly) to make popcorn in a brown paper bag. 6) Miscellaneous utensils. Besides the normal spoons forks we allow space for stainless steel or/and wooden spoons and spatulas, a garlic press, 2 adjustable measure spoons (also from Pampered Chef), a dry and a liquid measuring cup, small flexible funnel for refilling spices, pizza slicer (I make a lot of homemade pizzas), small assortment of knives and set of kitchen shears, a whisk, small cheese grater, loose tea strainer and smooth edge can opener. It may look like a lot but it all fits in our drawer without being too cluttered. But most importantly, it’s all stuff we use. 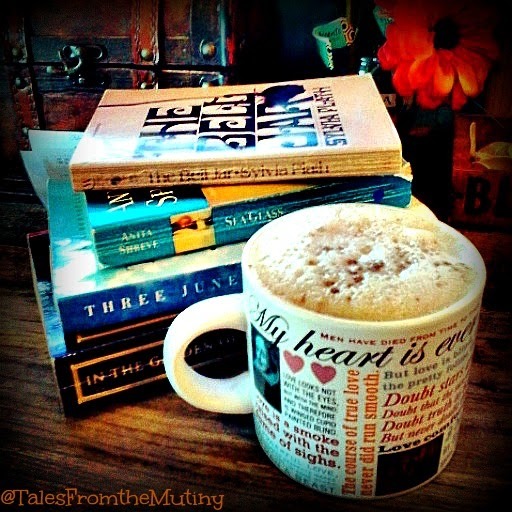 Books and latte…who needs anything else? 7) Milk frother. This might be the one piece of kitchen gear that seems frivolous but we all have those little things that bring us joy. I love this little thing. Every single night Clark and I enjoy a warm cup of Almond Milk with turmeric, nutmeg, black pepper and cardamom and it just tastes better with a little foam on top. And for $12 it really is a bargain when you consider how much money we used to spend on lattes every day when we used to work. 8) Induction cooktop (and stainless steel pots and pans). Part of the reason we had solar installed (that post will be coming soon) is to do more wild camping (aka boondocking) and while we do have a propane cooktop we also found out how easily we can burn through that propane, especially if it’s cold enough out to run the basement furnace to keep the pipe from freezing (our basement heater uses propane). Since the sun will be replenishing any electricity we use while going off-grid it only made sense to save the propane and go electric. 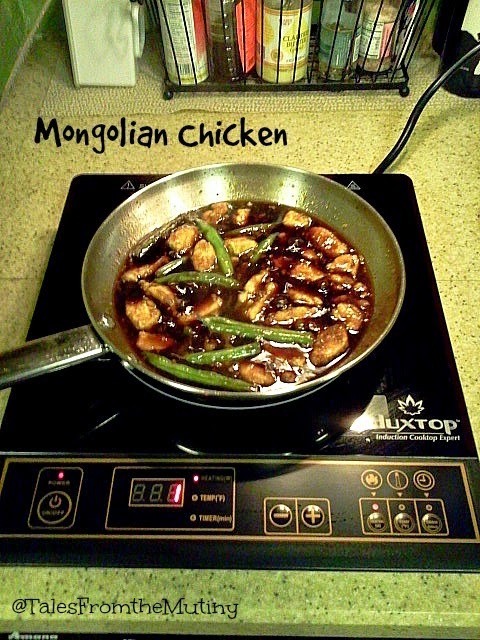 Our Duxtop cooktop cost around $66 and the 12 piece set of stainless steel pots and pans ran another $67. I’ve been cooking with these for the past 5 days and absolutely love them. I think this is a great investment and, truthfully, our pots and pans were way overdue for replacement anyway. Of course we have a few mixing bowls and baking pans but I wanted to give you a glimpse of the everyday tools I use to whip up both omnivore and plant-based meals. We also have the ever-so-popular Nuwave Mini but I find myself using it less and less but I’m not quite ready to part with it…yet. We’ll see if it comes back into the rotation when we start boondocking more. Other essentials (for us) include the Crystal Soda Stream and my Aeropress Coffee Maker. You can read about these in this post. For recipe ideas please check out this post which includes links to some of my favorite resources for meal ideas. 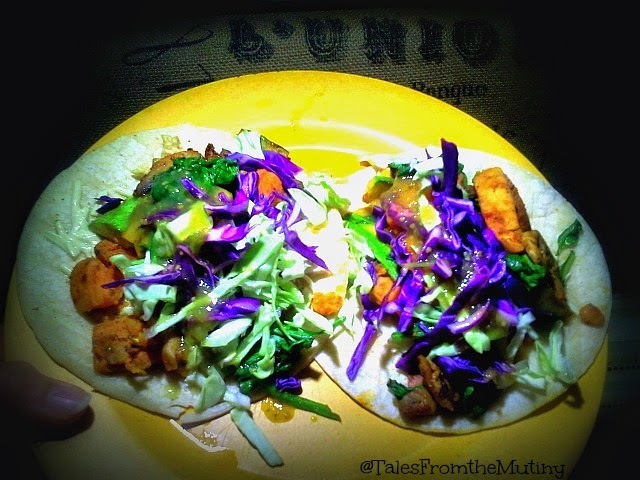 Homemade Sweet Potato Tacos. Kitchen sink kind of recipe. Recipe adapted from Iowa Girl Eats Copycat P.F. Chang’s Mongolian Beef found here. 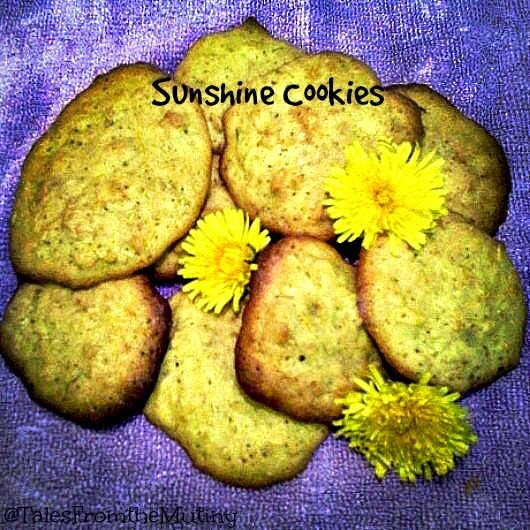 This recipe uses dandelion flowers!! 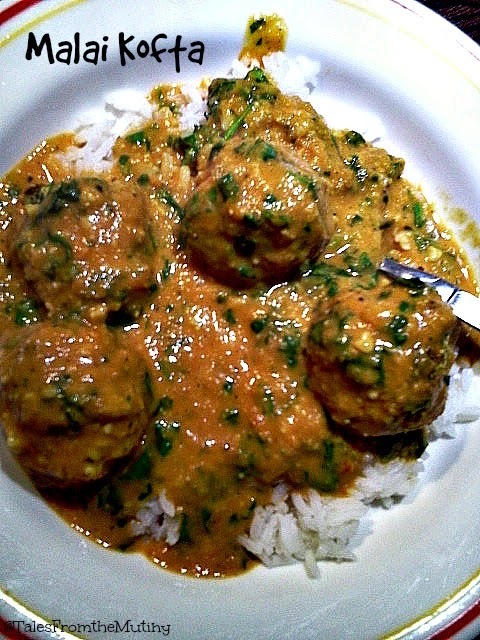 And you can get my recipe, which was published in Elephant Journal, here. It’s your turn…what’s in your kitchen? Tales From the Mutiny (aka Lynn and Clark Bonelli) is a participant in the Amazon Services LLC Associates Program, an affiliate advertising program designed to provide a means for sites to earn advertising fees by advertising and linking to amazon.com. really, really great post. . .we very rarely eat out. I love to cook, and hubs loves to eat. . .so it's a great deal.